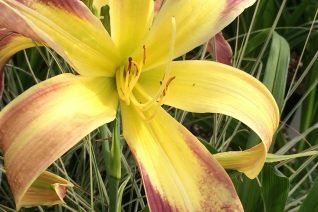 We don’t grow many Day lilies. To be honest they are kind of done. But we have chosen a half dozen that we think add a lot to a garden. 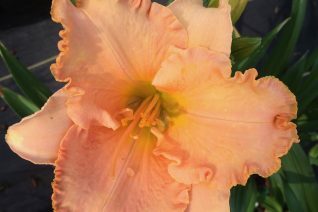 This variety is not only subtly beautiful with complex soft colors, it will often re-bloom through the summer if given ideal conditions. What are those? Rich, moisture retentive soil with regular, dependable irrigation through the hot months. The 3″ flowers have hints of cream, golden yellow, soft pink and even apricot. Delicious- as they are edible too. 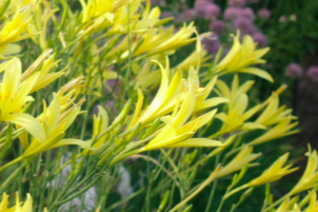 A long lived perennial that forms an expanding clump to 2′ tall and more than two feet wide. Full sun to the very lightest shade. Loved by butterflies. A good looking, long lived, trouble free plant. Completely deciduous in winter. One thing we know about Betty, she was obviously something of a size queen. 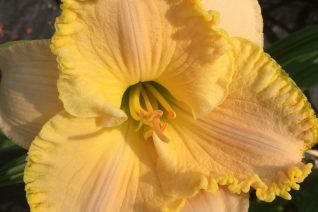 We LOVE this unusual dwarf daylily that exhibits HUGE outsized startlingly beautiful flowers for 4-6 weeks early to mid summer. To just 14″ tall the outrageous yellow/chartreuse and mauve flower explode open and stretch to 6″ across. Its unbelievable . Forms a spreading clump with mid-green arching strappy leaves. Screams to be at the front of a border or where the context of the huge flowers can be appreciated. Full sun to light shade and rich, moisture retentive soil. Regular water through the bloom period enhances the already outrageous display. Completely winter deciduous. A good friend of ours who is a day lily savant told us that we had to have this plant. So adamant was he that he sent us a good sized clump. Holy cow was he right on. 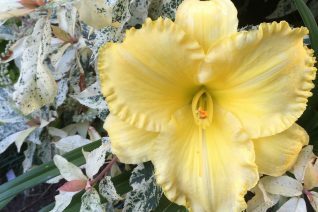 This is a large elegant perennial with elongated light yellow flowers that have a POWERFUL sweet citrus blossom aroma. The scent ramps up greatly at night and can be detected many feet away. Tall growing species as the flower scapes rise to almost 5′ tall. Each one holds multiple flowers. They close a little during the day but in the afternoon they slowly yawn open and POW! Here comes the perfume. Grassy foliage rises to about 2′ and a clump gets very large in rich, well drained soil with ample summer moisture. Full sun to very light shade. Give this big guy room to shine. Blooms for us July to September. Completely deciduous in winter. Big thanks Duane.